You are the only Greek Freestyle Rider who can flip long distance, how did you get that far? I’ m happy because i accomplished many of my targets …at this moment i ‘m in my most creative part of my life…great things is about to happen! First of all to have faith and love what they do, work hard for it and make it happen..
What are you going to do at SHOW ME? For SHOW ME i will give it all…I’ll start strong from the first day. I’ ll flip my dirt bike on a 20 m gap first time ever from a greek rider. At SHOW ME you’ll experience my most amazing tricks! 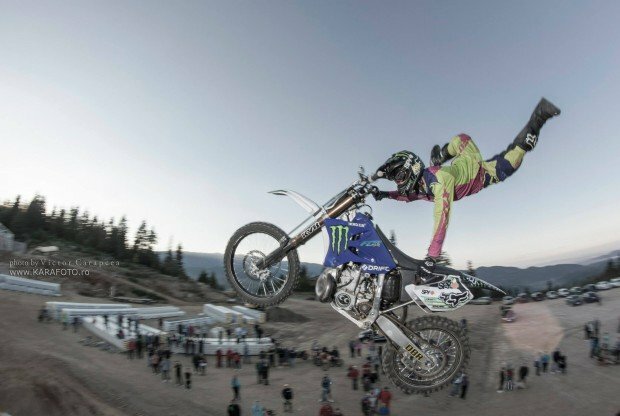 Together with my friend Stig Aron Froeseth we’re about to give you one of the most impressive Freestyle Motocross Shows you’ve seen in Greece! Life, Bike, Freedom is my destination and I am willing to travel all along! Some say you are a “multitool”. Why so? (Laughs) Maybe because I’ m doing everything that makes me happy in order to feel creative every passing day…i construct amplifiers and sound systems, i ride snowboard, bmx, kite, surf and miniramp on my skate..i set everyday targets in my life and i make them work for me in the best way, if this makes me a multitool then i suggest it to all. Do exactly what you love every day for you to be happy..Never give up, Peace!